This renowned vacation playground creates an authentic sense of place. Situated on a sprawling private white sand beach along the tranquil waters of the Gulf of Mexico, the enchanting ecosystem of the Florida Everglades is at your doorstep offering myriad opportunities for exploration and adventure. Experience true luxury in newly renovated guest rooms and suites, feed your intellect through locally sourced menu selections and interactive food and beverage experiences, and find balance, health, and harmony at the Spa by JW®. 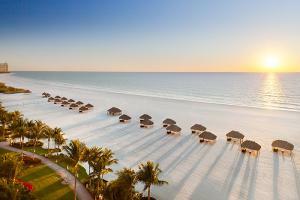 Following a $320 million renovation, the resort pays homage to the Balinese-inspired Marco Island heritage. Two private 18-hole championship golf courses, four swimming pools including a children’s tiki pool with waterside, 10 restaurants, an array of recreational activities including beach volleyball, dive-in movies and dolphin watching tours, and a children’s Tiki Tribe camp deliver endless opportunities for relaxation and fun. Located on three miles of pristine beachfront property, 48 miles from the Fort Myers Airport.